The evil Goa’uld System Lord Apophis is moving to invade Earth. The U.S. government scrambles to find some defense from the two powerful war ships, with its efforts being led by Colonel Samuels. General Hammond is powerless to override the arrogant officer’s ridiculous plans. SG-1 has gone missing, having acted against orders and gated off-world before the Stargate was shut down. The team has gated to one of the attack ships, and journeyed with it back to Earth. C4 explosives have been placed around the ship of Klorel, Apophis’s Goa’uld son, with the intent to blow it up before the attack begins. SG-1’s plans are thwarted when a second Goa’uld ship enters Earth’s orbit: it is the ship of Apophis himself. While the explosives can surely destroy Klorel’s ship, Apophis’s would remain to attack Earth. Before a new plan can be considered, SG-1 is captured. Bra’tac, a Jaffa servant of Apophis and close friend of Teal’c’s, places the mortally injured Klorel in a sarcophagus to save him. But when Bra’tac is ordered by Apophis to execute SG-1, he moves to free them. With his three loyal Jaffa warriors, Bra’tac joins SG-1 in a new attempt to save Earth. Meanwhile, Colonel Samuels has come to the S.G.C. to command the assault against the orbiting ships. He has helped to develop a powerful new weapon — missiles equipped with naquadah-laced warheads. The missiles are fired at the orbiting ships, but impact their energy shields and fail. General Hammond, disappointed but not surprised, continues to transport Earth’s best and brightest through the Stargate to a new world — the “Alpha Site,” where they may be forced to start a new Earth colony, should Earth fall to Apophis. Bra’tac’s original plan will no longer work: he intended to lead his men against Apophis in Klorel’s name, hoping to incite the two Goa’uld into fighting with one another. But with SG-1’s presence (and attack on Klorel), a new plan must be devised. The team captures Klorel’s ship, and Bra’tac maneuvers it closer to Apophis’s vessel. The group then uses the transport rings to move to Apophis’s ship. But Daniel is mortally wounded while defending the group. He is shot by a staff weapon, and asks to be left behind. While the team escapes to the other ship, Daniel guards their escape. After escaping Apophis’s clutches, the team moves to the chamber in which the energy shield is generated. A couple of grenades disable the shield, and Bra’tac prepares to die in a heroic fashion. O’Neill has other plans. With help from Bra’tac they locate the ship’s glider bay, and escape the vessel. Klorel’s ship explodes in a glorious ball of fire, taking the crippled ship of Apophis with it. There are two brilliant flashes in the night sky, and Earth is saved. Apophis and Klorel leave through the transport rings, and are presumed dead. 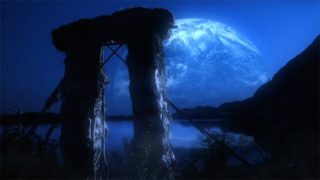 Daniel finds a sarcophagus, and uses the Stargate on board Klorel’s ship to escape to Earth’s Alpha Site (after which he dials home to Earth). And O’Neill, Carter, Teal’c and Bra’tac are picked up in orbit by the United States shuttle Endeavor. The team returns home to Earth one member short, and are overjoyed to see that Daniel is alive and has come home. Apophis is considered the biological father of Klorel, since he “seeded the queen mother” according to Klorel. Although Goa’uld reproduce asexually — a queen produces larva that are incubated by Jaffa — a genetic sample of the Jaffa’s species is necessary for the queen (“Hathor”). Apophis apparently provided this human sample for his queen. A Goa’uld sarcophagus apparently takes only a few minutes to fix many injuries, measurable by the C4 explosives countdown. Daniel crawls to a sarcophagus, is healed by it, locates the Stargate and leaves the ship in under six minutes. It is safe to assume that more serious injuries require more time inside the sarcophagus (Klorel suggested more time to more fully recover from his own injuries), though Daniel’s injury was apparently life-threatening. A probable inconsistency: the sarcophagus on Klorel’s ship not only heals Daniel of his injury, but it also neatly restitches his clothes. This was not the case when Daniel used the sarcophagus in the film. Apophis and Klorel flee the ship on the eve of their great victory, though they would likely have known nothing of the C4-powered explosion that was about to occur. This is no doubt because Apophis saw Klorel’s ship moving dangerously close to his own, and then saw that his shields had been disabled. Apophis and Klorel are probably still alive. They use the transport rings, presumably to move from Apophis’s ship to Klorel’s — where the Stargate is located. Some or all Goa’uld attack ships are equipped with defense shields. According to Bra’tac, a Goa’uld ruler’s power is more often challenged by a son than by an enemy. Bra’tac – Bra’tac is about 153 years old. He also states that he went through a great deal to regain Apophis’s trust, and join his campaign against Earth. Now, he has openly defied Apophis, Klorel and the Goa’uld false gods. Surely, he will never again regain trust and serve in a Goa’uld army. What will become of Bra’tac? 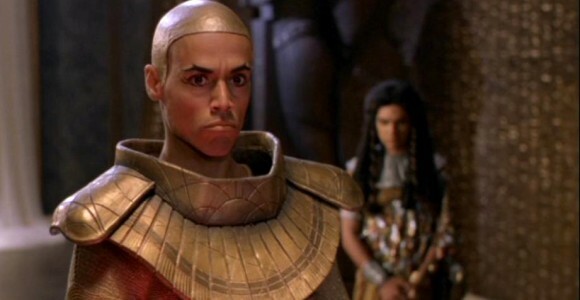 How can he live on Chulak, a planet full of Jaffa loyal to their “god” Apophis, after openly rebelling? What will become of Klorel? Will Apophis forgive his failure? Can Skaara, his host, achieve some victory in regaining control of his body? VOTE! How would you rate SG-1's "The Serpent's Lair?"